How many different Remote Controls do you have and can't find? Replace them today with 1 Universal TV Remote Control!!! 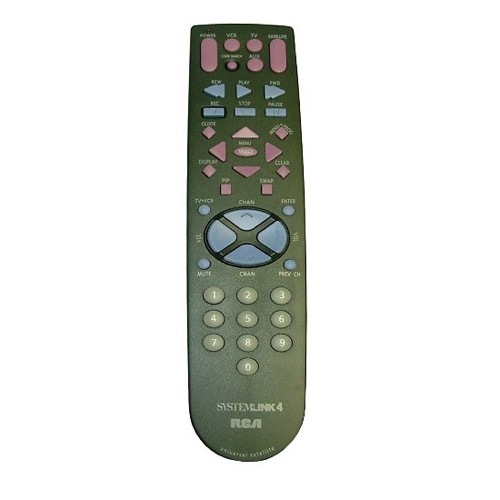 RCA Systemlink 4 Universal 4 Device Replacement Satellite Receiver TV Remote Control, that controls your TV, VCR, Satellite or Cable Box and Audio Component. It replaces 4 remotes!!!! This 1 button feature allows you to quickly, and easily program your TV, Satellite, Cable and VCR!!!! Press and hold code search until light stays lit; release. Press Power Button repeatedly until TV turns off.